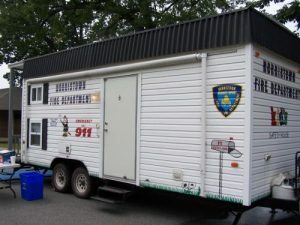 The safety house is a twenty eight foot long mobile educational trailer that graphically demonstrates, through various “hands on” exercises, what children need to know. To schedule a FREE fire prevention demonstration or to schedule the Kid’s Fire Safety House for your school or community event please contact the Fire Marshal at (610) 270-2894 . Help protect yourself by viewing the Residential High Rise Safety Brochure put together by the Norristown Fire Department. The fire marshal’s unit also operates a smoke detector program. Free smoke detectors are available through this program. Any Norristown resident needing a smoke detector is encouraged to call the hotline at (610) 270-2870. Remember to check the batteries in your detectors! Carbon monoxide (CO) is an invisible, odorless, colorless gas created when fossil fuels (such as gasoline, wood, coal, propane, oil and methane) burn incompletely. In the home, heating and cooking equipment are possible sources of carbon monoxide. Vehicles running in an attached garage could also produce dangerous levels of carbon monoxide. Because one cannot smell, see, or taste it, carbon monoxide can kill you before you know it is there. Where do I place my carbon monoxide detector? Place a carbon monoxide detector near the sleeping area. A second detector should be located near the heating appliance. At least one CO detector should be battery powered. What do I do when my CO detector goes into alarm? Get out and call 911. Do not waste time opening windows, this could be deadly. It also allows firefighters to respond with sensitive equipment to trace the source. Help protect yourself by downloading, printing, and completing the Fire Prevention and Fire Safety Checklist. The following is an informational document with common questions you may ask and actions you may need to take if a fire occurs at your residence. Emergencies and disasters strike quickly and often without warning. They can disrupt our lives, force us to leave our homes, or even confine us for days without essential services like electricity, phones, or water. How ready are you and your family? One of the first things you can do is sign up for our ReadyMontco notification system. This program delivers alerts about severe weather and other important events in Montgomery County to the devices of your choice. Whether you prefer emails, text messages, or even a good ol' fashioned phone call - you decide the option that works for you! The following is an informational document from PECO Energy to show what they do, and what you can do to be ready for a power outage. PECO power outage information. The following is an informational brochure on Municipal Ordinance 11-08 which prohibits grilling on combustible porches, decks and balconies and also barbecue fire safety. Here is a checklist that will assist you in preparing for your life safety fire inspection.